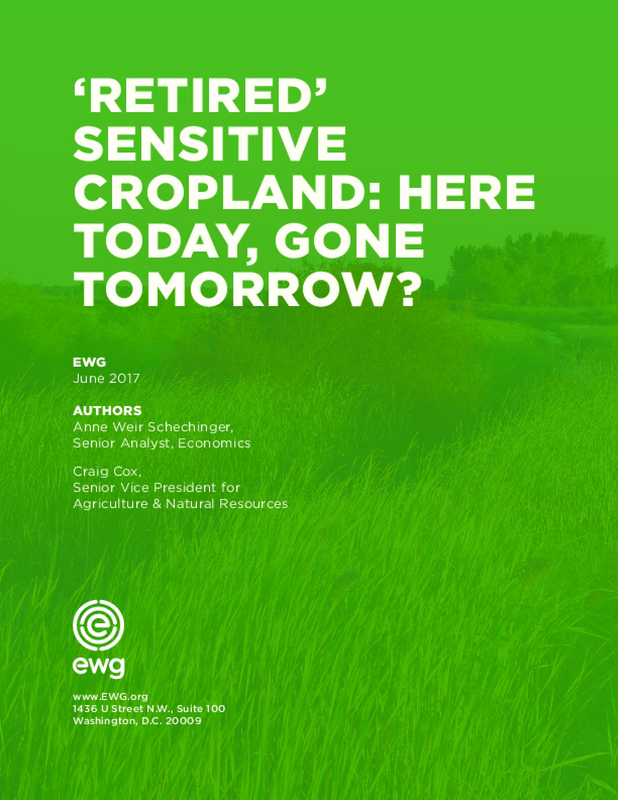 'Retired' Sensitive Cropland: Here Today, Gone Tomorrow? Falling commodity prices have renewed farmers' interest in expanding the Conservation Reserve Program, or CRP, which protects environmentally sensitive land by paying farmers "rent" to take it out of crop production. CRP has long been the cornerstone of federal conservation policy, but its benefits are fleeting. Once the rental contracts expire, farmers go back to planting crops and the benefits are lost. Long-term or permanent conservation easements would do a much better job of mitigating the negative environmental impacts of American agriculture. That's the finding of a new EWG report that shows how conservation easement programs are better for the environment and are better investments for taxpayers than CRP. Traditional row-crop agriculture is increasingly causing environmental and public health problems. Threats to public health through contaminated drinking water, poor air quality and toxic algal blooms are widespread and costly, and fish and wildlife habitats and populations face ongoing risks. Although CRP provides conservation benefits that help alleviate these threats, the benefits are lost as soon as the contract expires and land is brought back into crop production. Between 2007 and 2014, 15.8 million acres dropped out of the CRP program and were not re-enrolled. These 10-year contracts cost taxpayers an estimated $7.3 billion to rent. At the same time, only 6.7 million "new" acres were enrolled in CRP, for a net loss of more than 9 million acres. Programs that focus on long-term or permanent easements already exist. The Conservation Reserve Enhancement Program works with states to target high-priority objectives, including conservation easements. The Wetland Reserve Easement option in the Agricultural Conservation Easement Program enrolls acres in easements to restore, protect and enhance wetlands. Instead of expanding CRP, more funding in the 2018 Farm Bill should go to both of these highly effective programs. That would be a better deal for taxpayers, the environment and public health. Copyright 2017 by Environmental Working Group. All rights reserved. Title: 'Retired' Sensitive Cropland: Here Today, Gone Tomorrow?